12 months a year of Pittsburgh? Absolutely!! What a great holiday gift idea…and for a good cause! 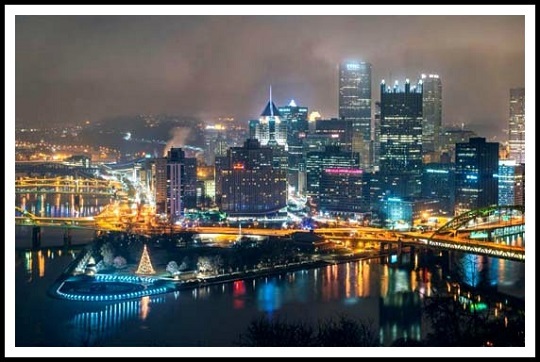 After BIG demand from the Steelers faithful, our Pittsburgh cityscape photographer and friend, Dave Dicello has made his beautiful photography into a 2015 calendar. The calendars are $25 each, and Dave is donating $1 from every calendar sale to WTAE’s Project Bundle Up. You can see each image in this beautiful calendar as well as order yours right here. “Pittsburgh. The Steel City. The City of Champions. The City of Bridges. It has many names, but I know it by one: home. Pittsburgh is the perfect combination of “big” city living and a small town feel. We have history in our steel mills, our sports teams and our culture that make us unique in terms of great American cities. The other thing that is great about the ‘Burgh from a photography standpoint is that no matter how you look at it, you are sure to have an incredible view. From high up on Mt. Washington or the West End Overlook, or down low on the North Shore or Point State Park, the views of my hometown rival some of the best in the world. Enjoy more of his breathtaking images – many of which he shares on Facebook & Twitter – of Heinz Field, PNC Park, and the Penguins on the ice, on the portfolio page of his website! How about a Pittsburgh Skyline filled with chocolate? Oh yeah!! The Ben Roethlisberger Foundation and Sarris Candies teamed up this NFL season to raise money for K-9 units across the country – and what a tasty way to do it! To help involve the community in supporting Ben’s foundation, Sarris Candies has designed a cause-marketing program that allows chocolate lovers to purchase their favorite Sarris’ candies guilt-free…just in time for holiday gift-giving! 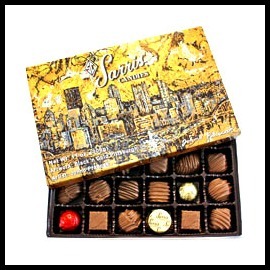 You can use a special group code of 77-7777 on Sarris Candies’ website, (www.Sarriscandiesfundraising.com) to purchase any of Sarris’ expansive candy fundraising catalog products, like the Pittsburgh Black and Gold Assortment above. Sarris will then donate 25% of the purchase price to Ben’s foundation.